Madison’s summer was well under way when I was lucky enough to have a few of my besties visit all the way from Minnesota!! I was feening to be in the kitchen cooking and also to satisfy my sweet tooth. The best thing about visitors is I can cook the tasty treats I dream about without being worried I will devour the entire dish MYSELF! My roommate and I had just come back to our apartment after spending a few hours moseying around the Saturday Farmer’s Market. I had a bundle of rhubarb, raspberries and the fixings to make a mean dessert bar. 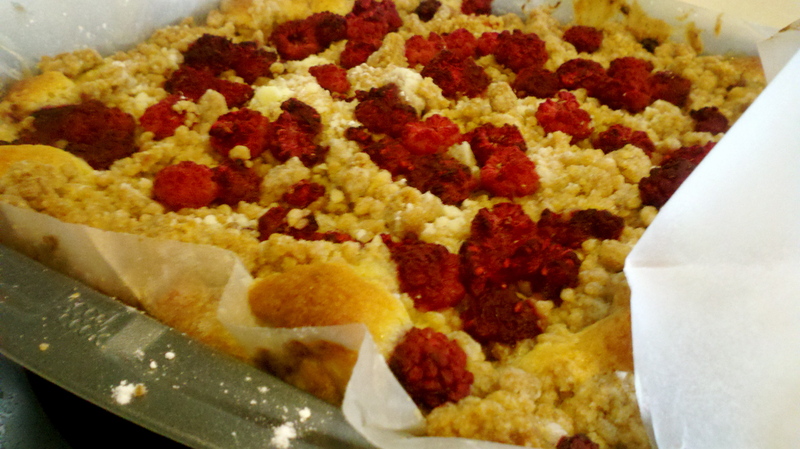 I took to my Mac in order to find a recipe I could get creative with, and landed on Martha Stewart’s Rhubarb Crumb Bars. The prep work for the rhubarb took a while but otherwise I was baking away within minutes and popped my version of the cake as a Raspberry and Rhubarb Crumble in the oven and took a break from cooking in 90-degree weather. Forty minutes later my crumb cake was out of the oven and ready to cool so that ALL my friends could devour it. The cake had a really nice flavor because the rhubarb is more of a tangy taste instead of many other desserts loaded with sugar. I tried some hot out of the oven as well as later on when it cooled, and my vote is hot with ice cream. Cooled off allowed the flavors to set in and was more along the lines of a pound cake. Either way it was a success and with a full apartment it didn’t even last 24 hours. Bon appetit and FYI the leaves of rhubarb are toxic, YIKES, steer clear! !